Watching a grandmother’s birthday party via Skype seems like a quotidian action. Not to HSU student Marissa Lisette Sánchez, who writes: Lo que no saben es lo especial que mi abuelita es para mí (“They do not know how special my grandmother is to me”). CouRaGeous Cuentos: A Journal of Counternarratives.The line is from her poem “What They Don’t Know” and it’s one of several creative works by HSU students in the second volume of CouRaGeous Cuentos: A Journal of Counternarratives, released last week. The journal is an annual publication of the Department of Critical Race, Gender & Sexuality Studies and showcases responses to writing prompts given by CRGS faculty member and journal Editor-in-Chief Maria Corral-Ribordy in her Ethnic Studies 107: Chicanx/Latinx Lives class. “This publication is about counternarratives that challenge the dominant narrative about students, their families, and communities,” she says. Corral-Ribordy has offered these writing prompts since 2014 and says each time students have been enthusiastic not only to write their stories but to share them in class, as well. Inspired by their passion and wanting to make the students’ work available online, she approached Library Dean Cyril Oberlander who suggested and supported the idea of a digital journal that could be published periodically and include the work of future students. 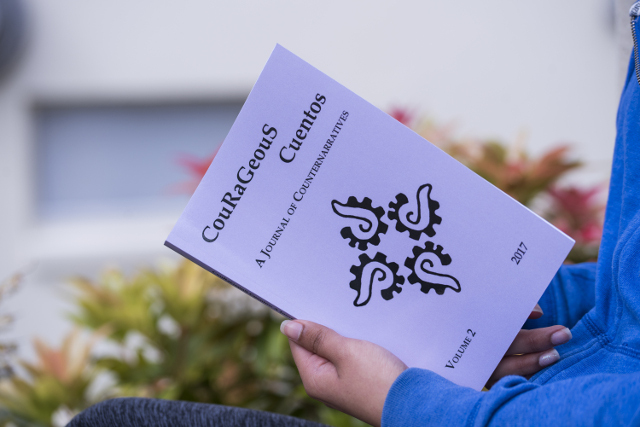 The first and second volumes of CouRaGeous Cuentos are available on Amazon. PDF versions are also available on Digital Commons (digitalcommons.humboldt.edu/courageouscuentos), an online clearinghouse for academic journals from universities and disciplines around the world. What readers will find is a collection of stories, poems, and reflections that focus on everything from families and stereotypes to racism and religion. And while most of the works are in English, some are in Spanish. Others, like Sanchez’s poem about her grandmother, are written in both. Sánchez says Spanish allows her to express emotionally charged moments. The line “Lo que no saben es lo especial que mi abuelita es para mí,” (“They do not know how special my grandmother is to me”) was one of those moments. Sanchez says the writing prompt that inspired her piece was a rare and meaningful opportunity to share her experience. “It was liberating and empowering to write about ourselves and what we’ve been through,” she says. For more information about the journal, contact the Department of Critical Race, Gender &Sexuality;Studies (707) 826-4329 or Maria Corral-Ribordy at (707) 826-3826.